Phil Lesh & Friends TXR Artist Edition Release. The image above is the green artist edition of 100, it measures 15″ x 22″ and will be $75 (+ shipping). There will also be a few Pearl editions available as well (image below) – but each household is limited to just one single poster purchase. As an attempt to get these into the hands of the Heads, we have made these products password protected – Interested customers should click here. We expect our limited inventory to sell out fast…. I love this print….very awesome. Good luck to all!!!! That Pearl looks great! I hope to be able to see it in person. Pearl looks great! Hope I’m one of the lucky few! Would love an art print of this someday! I need this long legged turtle in my life ! Thanks for the update ! Whoa, looking forward to the opportunity! 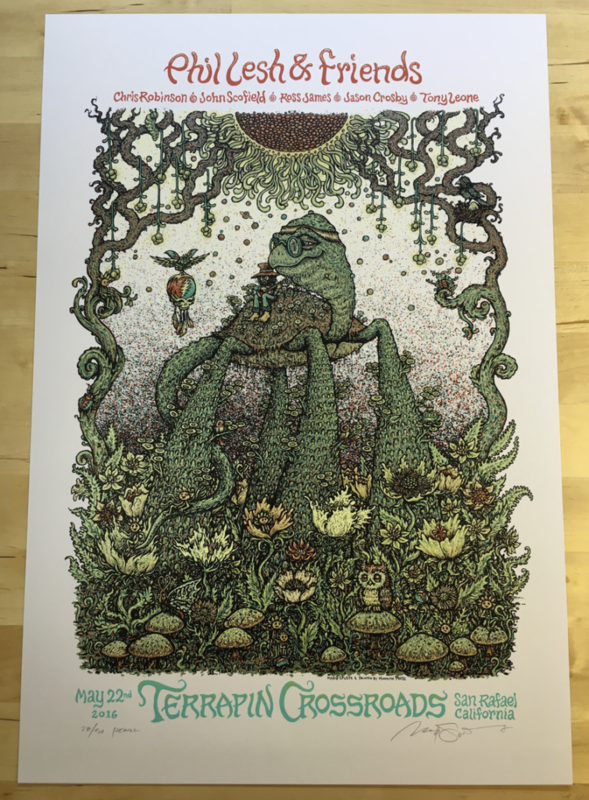 Spusta Gnome: Are the prints sold from Terrapin listed as ‘variance’ the pearl addition above? Yes….only 3 versions of this print. Thank you! 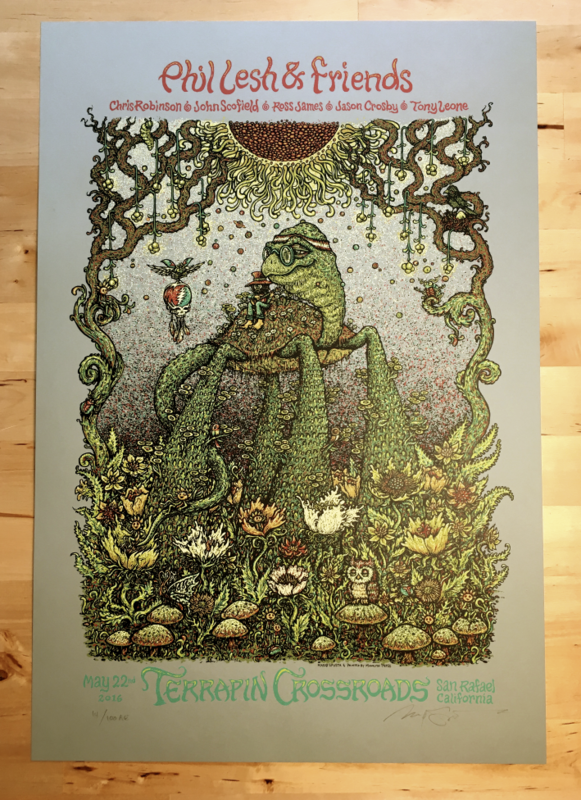 Stoked to get mine from Terrapin! Not getting mine from Terrapin!! Boo on the computer glitch. Unfortunately I will not be as stoked as I had intended. I’m sorry you got shafted. I got mine from Terrapin, but it came dented and creased (on the actual image) due to the huge, flat, extremely flimsy cardboard packaging. :'( I am happy to have it, but sad it’s in the state its in. Even framed the damage will be able to be seen. I too fell victim to this “computer glitch”. Between the glitch and all the damaged prints, total bummer on the Terrapin drop. Would have been fine if they alerted us before they dropped from the shop. Well, here’s to hoping I’m lucky on the art print!! Really sorry I missed this one, had it for a second! One of the coolest terrapins I have seen. Love it! Nobody does bass like Phil! Anxiously awaiting more info! woot! stoked to pick one of these up. If there are any refunds please keep me in mind.. Keeps telling me we can’t find the page you are looking for! I know the answer though! Um, what happened? Now it says page not found. I never found where to buy these. Really wanting that green! Beautiful! Some rise, some Fall, to get to Terrapin^!! !